Five frames of a famous time-lapse series of a galloping horse have been encoded into the DNA of E. coli bacteria, showing the untapped potential of living cells to store data. The researchers from Harvard University in Cambridge, Massachusetts, used a genome-editing tool known as CRISPR to carry out the task, showing that bacteria can be harnessed to use their own genetic material as a kind of biological hard drive. In 2016, a team at the Wyss Institute for Biologically Inspired Engineering and Harvard Medical School led by Wyss Core Faculty member George Church built the first molecular recorder based on the CRISPR system. The CRISPR system in bacteria helps them develop immunity against the constant onslaught of viruses in their environments. It captures viral DNA molecules and generates short “spacer” sequences from them as a memory of survived infections. Bacteria continue to add new elements upstream of previous elements in a growing array located in the bacterial genomes’ CRISPR location. The CRISPR-Cas9 protein uses this memory to destroy the same viruses when they return. Cas9 is now widely used a genome-engineering tool, but other parts of the CRISPR system have so far have not been much exploited. In their latest published study, George Church and his colleagues describe how they engineered two other proteins of the CRISPR system, Cas1 and Cas2, into a molecular recording tool. They then successfully encoded into living cells the digitized image of a human hand − reminiscent of some of the first paintings drawn on cave walls by early humans − and their five-frame horse movie. 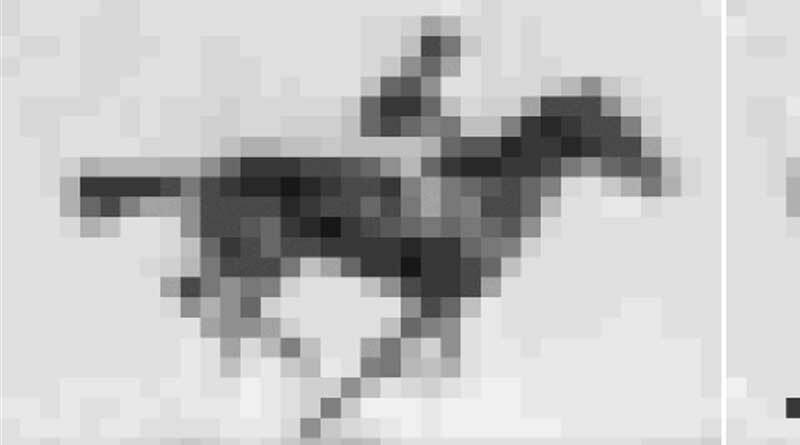 The horse movie was a simple pixellated horse based on the now iconic series of of time-lapse photographs by Eadweard Muybridge in 1878, which became famous for proving that a horse’s four hooves do not touch the ground at all times during a gallop. The five horse frames were retrieved in the correct order. Their approach not only opens entirely new possibilities for data storage; the study team believes it could also be engineered into an effective memory device able to create a chronological record of cells’ molecular experiences during development or under exposure to stresses or pathogens. Their findings have been reported in the journal Nature. The team used still and moving images because they represented constrained and clearly defined data sets; the movie also gave the bacteria a chance to acquire information frame by frame. In future work, the team will focus on establishing molecular recording devices in other cell types and on engineering the system to memorize biological information. The study team comprised Church, Seth Shipman, Jeff Nivala, and Jeffrey Macklis. The report on the study in Nature can be read here. CRISPR-Cas: Molecular Recording from Wyss Institute on Vimeo.